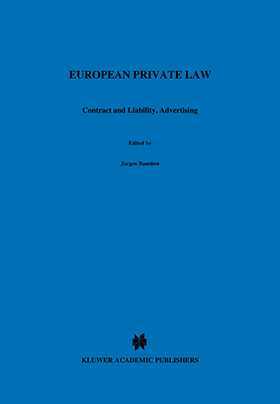 This collection will satisfy the need of practitioners for access to the private law of the Community, for the obligation to interpret national law in conformity with EC directives often requires a comparison with Community legislation. At the same time the collection will facilitate analysis and may thereby contribute to an improvement of the texts and their understanding. The collection does not reproduce the entire private law of the Community; it includes enactments that exclusively or mainly concern private law. The European acts are binding in many languages. A book which reproduces all of them would be desirable, but, for its price, impossible to sell. This book is conceived so as to provide a synoptical reproduction of different language versions of one and the same act, and to allow for a permanent comparison. It follows that it is limited to four languages which are selected in accordance with their frequency within the Community. They include the working languages used by the Community agencies in the legislative process. The acts are reproduced as amended by later secondary legislation, but without taking into account the renumbering of the provisions of the EC Treaty by the Treaty of Amsterdam.